This is quite possibly the worst draft I have ever covered. But not the worst draft ever. Oh no. I’m not gonna cry. Granted, this was not readily apparent when Dave talked about the College Wins Produced numbers for 2012-13 or when Ari charted them yesterday. 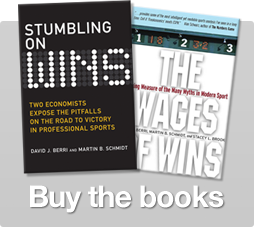 The problem lies in that Wins Produced is a comparative metric. Yes, there are players who were outstanding in the NCAA…in comparison to their peers. Their peers were just utterly terrible. The number to keep in mind is 12.2 Win Score per 40 minutes. To put this in perspective, there were 44 Players from the 2010, 2011, and 2012 drafts that had a better Win Score per 40 minutes than every player who played more than 400 minutes in the NCAA in 2012-13. There were 16 players drafted in those three drafts who projected better than every single player likely in this draft but one. Kawhi Leonard, Kyrie Irving, Derrick Favors, and Anthony Davis all had better numbers at 19 than every single player in the NCAA right now. Really, this draft is so bad that it made me do some extra research. Granted, it doesn’t take that much to get me started. We will get to that in a bit. First let’s cover the basics. Welcome to my fourth annual draft preview and rankings, where I take it upon myself to write, project, and speculate about the NBA draft using a surprisingly effective draft model to predict player performance using data publicly available on the internet. Stunning I know. Using this data, I built two models to predict the future performance of NBA draft picks (go here for the model build parts 1 & part 2 ). In very general terms, the models use the available data to predict future performance for each player coming into the draft from the NCAA. Based on that prediction, a ranking is done and a draft recommendation is generated. A full review (here) for a full breakdown and here for the 2011 version). That was a fun 72 hour build. Again, that’s the productivity projection for every eligible NCAA draft prospect who made it into Draft Express‘ Top 100 or was identified by the model as a possible NBA player. As always, my plan is to continue to monitor these projections in the future. Let’s review the models real quick for any newcomers. I built two draft models and I called them Yogi and Booboo. They both use a series of publicly available factors (WS40, Age, Height, etc.) to project the player’s Wins Produced numbers for the duration of a player’s rookie contract in different ways. Yogi gives the go ahead for drafting at 0.090 projected WP48 and Boo Boo does the same at 0.067 WP48. A simple test for the models is to look at the correlation between where the player was picked, where the models suggested picking him, and actual rank by draft in terms of production. Draft order vs production shows minimal correlation with an R-square of about 5% . It jumps to 25% for the predicted production rank. The models perform better than a top 3, top 5, or top 10 pick. So to review, using publicly available data we built a model that picks draft winners at a 80%+ rate, which is, in general, better than having a top 3 pick in the draft. But you’re not really here for the science are you? Let’s give you the money shot. That is the smallest list of draft recommendations that I have ever given (see table below). Let’s do some takeaways shall we? Victor Oladipo is the truth. He’s the only sure thing in this draft. After him, it’s all pure speculation. The other prospects recommended by the model likely to be drafted are: C.J. McCollum, Kentavious Caldwell-Pope and Nate Wolters. As for the likely undrafted prospects, all are really perfect for your D-League team, and I really would not be surprised to see them doing well next season in Europe (or with the Austin Toros). As for the rest of the prospects? The best advice I can give is based on the misses we’ve had before (David Lee, Joakim Noah, Andre Drummond). In this kind of scenario, if you can’t trade out, you draft for potential, size, or hidden talent. Younger and taller players are better, as are players that play on deep and talented teams. By that logic, I like Noel, Ben McLemore, Cody Zeller, and Alex Len (in that order) of the players not recommended by the model. Outside of that, my advice to a team would be to look to trade or look to Europe. We will get to that tomorrow. 13 Responses to "2013 NBA Draft Extravaganza: The Worst Draft Ever!" Is Noel off the list due to playing time or performance? What variable is driving Noel’s projection so low when he was so productive at 18? I am probably a little biased as a Michigan fan, but I think the model is a little too harsh on Burke. My guess is that his height is hurting him, but his standing reach, wingspan and vertical should mitigate at least some of those concerns. I am guessing those aren’t built into the model? Burke was a very effective NCAA player, and he’s still really young. Given his total measurements, not just his height, and productivity, I can’t see a good reason to keep him off the nice the list. I can see a Ty Lawson type of player here, although maybe not quite as good, and I think most lottery teams would be thrill led with that this season. Okay seriously, this Mike Hart stuff has got to stop. He was a senior who averaged less than 20 minutes a game, and a 2/3.9/1.1 line. Sure his percentages were nice, but come on. He will never play a single minute in the NBA. Read between the lines says trade your pick. Going with Dave, why is Noel not an elite prospect? Nobody has ever posted those kind of block/steal numbers, he rebounded well and he was pretty efficient as a scorer. He even had a 1:1 Assist to TO ratio. I don’t understand. What happened to DJ Stephens, I thought he dominated in productivity and was set to rank extremely high? I was just about to chime in on Nerlens,but I assume that’s part of the miscalculation. BTW, I assume the the numbers above on the model’s performance are from the training phase. Have you done an out of sample test on 2010-2012 yet? The numbers are thru 2010 because it’s the last draft with four years play.